I won't lie, the book trailer is sappy in the extreme, but the book itself looks like it might be interesting. It doesn't seem to be available on Amazon or Thomas Nelson's site or anywhere else, though. I wonder if it's actually been published yet, or if this is just a "coming attraction." Collector Victor Gulotta has an article here about the Dickensian collection he's about to sell. It sounds wonderful. How I wish I could see it before it's broken up. Just the few photographs with the article are so tantalizing! A while back, we discussed possible ways of celebrating Dickens's 200th birthday next February. One suggestion was self-publishing a book of our own essays on Dickens. Since I made that suggestion, I've explored the world of self-publishing, and discovered that it is (1) difficult, (2) time-consuming, and (3) expensive. So, with a little help with a LiveJournal friend who runs an online magazine, I've come up with an alternative idea. Charity will be publishing a Dickens bicentennial edition of her magazine, Costume Chronicles. I suggested to her that we here at Dickensblog submit articles for it, and she liked the idea. That way, we still get to write and publish articles in honor of Dickens, and she'll have a bunch of excellent essays for her magazine! Go on over to Charity's site and take a look at Costume Chronicles to get an idea of the kind of thing she's looking for. (Note that the issues are .pdf files.) And let me know what you think. If we decide to go for it, I'll give you all the necessary information about deadlines, word counts, and so forth. The Library Theatre in Manchester, England, came up with an inspired idea: putting on a production of Hard Times in a mill very much like the ones in the story. In fact, Jonathan Scofield writes, Dickens probably saw this very mill during one of his visits to Manchester. More articles and reviews are here, here, here, and here. Okay, I'm joking about "pick me" -- I'm not much of an actress, and I can't do a British accent, and I can't get to Britain in September, and . . . oh, well, you get the idea. But I am going to try to think up some good casting ideas, and tweet them his way. Feel free to do the same! Or, if you're not on Twitter, share them here and I'll be happy to pass them along! Now I'm off to go pillage our old Sydney Carton casting thread for ideas . . . The Chief Justice of the U.S. Supreme Court quoted Bleak House in a ruling on the Anna Nicole Smith case. Guess Dickens has finally hit the big time, huh? Congratulations to UC Santa Barbara student Carmon Reynolds, whose project on Dickens won a major research award! In our latest installment of "Where in the world is Gerald Dickens?" the actor is bringing his one-man Nicholas Nickleby to Liverpool on Sunday. In an essay at PopMatters, Nathan Pensky compares HBO show The Wire with Oliver Twist. "Charles Dickens' favorite fair is back," reports the Telegraph's Dominic Cavendish. Click here to read about the return of the Greenwich Fair and why Dickens enjoyed it so. Thanks to the Jane Austen blog Austenacious for linking to us in their recent post about Dickens! 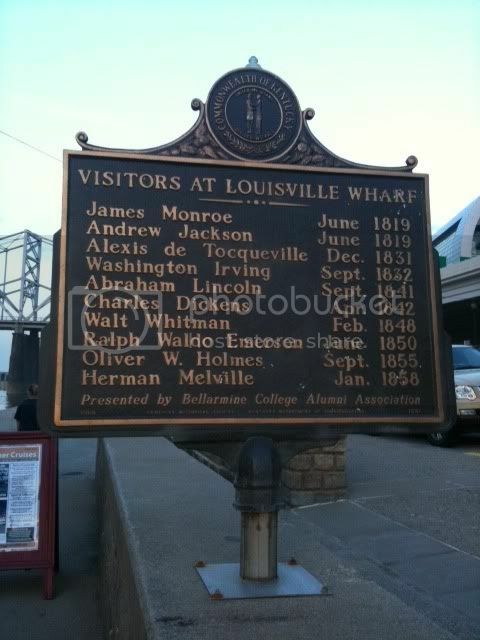 And finally, thanks to my friend Wendy for sending along this picture from a trip to Louisville. The original Bleak House is for sale for £2 million. When I saw that, I had a serious case of déjà vu, because I remembered posting back in 2009 that the original Bleak House was for sale for £2 million. I guess either someone bought it and then changed his mind, or it's been on the market for a very long time. Here's someone who actually wishes a Dickens book were longer. I can't say I've ever seen that before. Starting Wednesday, the blogs Old-Fashioned Charm and Elegance of Fashion will be co-hosting a Period Drama Film Tournament. Looks like there'll be some Dickens adaptations among the contenders. I'm still miffed that Henry Tilney beat Sydney Carton in Elegance of Fashion's last tournament (*GRUMBLE*), but in all fairness, I guess it wasn't really the blog's fault. Still, let's hope things turn out better this time! With all this Great Expectations talk, I was getting a bit worried that I hadn't heard anything about the Edwin Drood adaptation lately. So I went looking for news, and fortunately, it appears that it's still a go. This blog states that, although BBC4 is facing some cutbacks, Edwin Drood "remain[s] in the BBC4 pipeline." (It's a very long post; the Drood mention is in the second paragraph.) And Masterpiece's Rebecca Eaton mentions it in this video (around the 1:40 mark), which I believe is pretty recent. Sometime this week, if I get to it, I'll float a few of my own ideas about casting. Of course I'm batting zero so far with my Great Expectations hopes/predictions, but it's a fun exercise anyhow!